It is a pleasure to have the opportunity to participate in the Federal Reserve Bank of Atlanta’s 21st Annual Financial Markets Conference. This year’s topic, focusing on the connection between liquidity and financial stability, is an excellent one. As the first speaker, I thought it would be useful to lay out what I see as some of the key issues. I may raise more questions than provide answers, but, hopefully, my remarks will help to stimulate our discussion and debate over the next two days. As I see it, in the context of our financial system there are two distinct types of liquidity. The first is what is typically referred to as market liquidity. I would define market liquidity as the cost—both in expense and time—of buying or selling an asset for cash. Market liquidity reflects a number of factors, including any direct transaction expense, such as brokerage costs; the price the transaction is executed at relative to the midpoint of the bid-ask spread; how much, if at all, the transaction moves the market price; and the immediacy or speediness with which the transaction can be completed. With respect to market liquidity, there are a number of important open questions. Has market liquidity declined for some asset classes? If so, what are the causes? In particular, has the increase in the regulatory requirements imposed on systemically-important securities dealers adversely impacted market liquidity? If this is the case, are there adjustments that could be made that might improve market liquidity without impairing financial stability? The second important type of liquidity is funding liquidity. By funding liquidity, I mean the ability of a financial entity to raise cash by borrowing on either an unsecured or a secured basis. Although market and funding liquidity are often treated as distinct, they can be closely related. This is especially the case during a financial crisis. If funding liquidity declines because of market stress, for example, this may cause intermediaries to become less willing to provide market liquidity. Declines in market liquidity, in turn, may further impair funding liquidity, creating a negative feedback dynamic. Capital and liquidity requirements play a role in preventing such a self-reinforcing negative dynamic. The central bank may also have an important role to play as the lender-of-last-resort. When and how the central bank intervenes―and what the appropriate preconditions should be to maintain market discipline and mitigate moral hazard―are important open questions. But these metrics don’t tell the whole story. In particular, we have significant data gaps that make it difficult to comprehensively measure market liquidity. 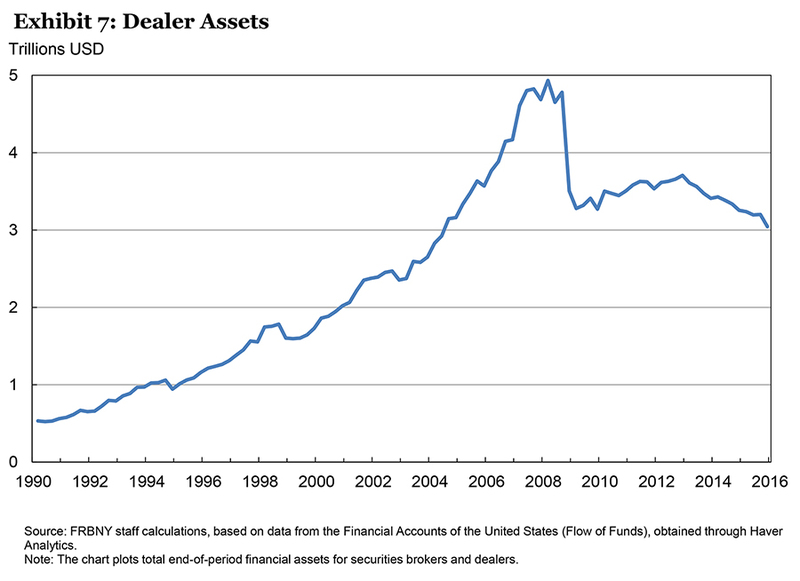 For example, in the U.S. Treasury market we have poor visibility into dealer-to-customer transactions. In this market segment, business is conducted bilaterally on an over-the-counter (OTC) basis—typically by phone or through electronic trading platforms like Tradeweb and Bloomberg that are based on the traditional request-for-quote model. The U.S. Treasury has issued a detailed request for information seeking public comment on the many factors that are affecting the structure and liquidity of the U.S. Treasury market, and is seeking comments on the relevant data gaps.4 This is an important step that will help clarify what further work is needed in this area. Even in the corporate bond market where we have detailed TRACE transaction data, this still tells an incomplete story. TRACE data show what trades have taken place, not what trades have potentially been foregone because of any possible diminution of market liquidity. Gaining a better understanding of this phenomenon is being actively researched by my staff. 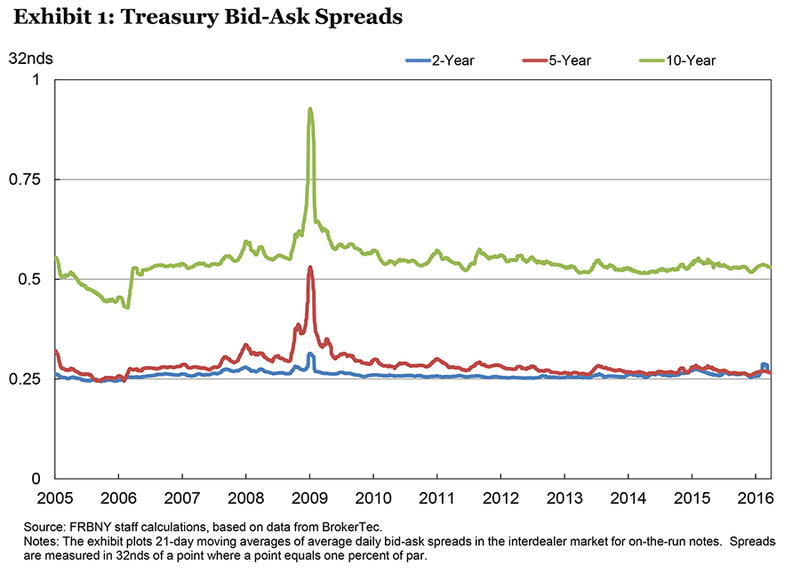 In contrast to the market liquidity metrics such as bid-ask spreads, indirect evidence on market liquidity suggests that there has been a decline. Asset managers report that large blocks of securities are now harder to buy and sell without generating significant movements in prices. 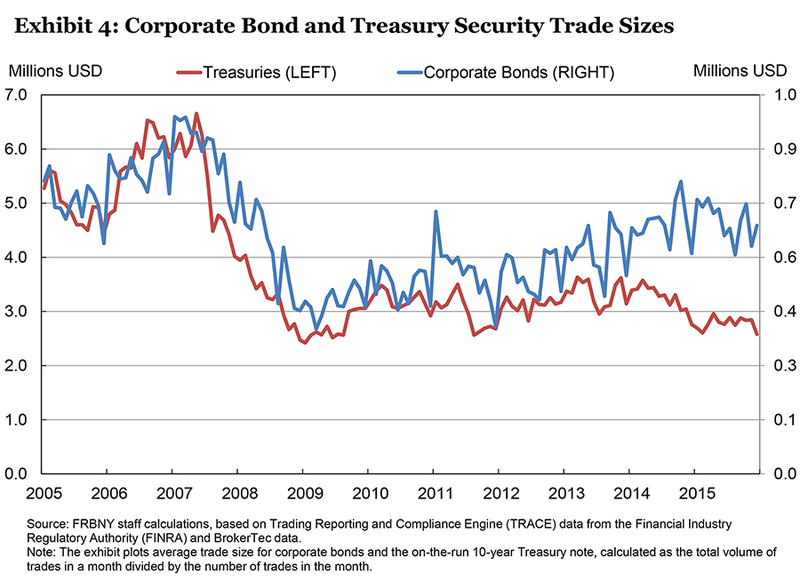 Also, average trade sizes have decreased (Exhibit 4) and there is evidence of a growing bifurcation in the corporate bond market, with greater activity and liquidity in those bonds that were issued more recently, larger in size or brought to market by larger issuers. Also, capital and liquidity requirements for the largest securities dealers—which have been raised significantly since the financial crisis—might have adversely impacted market liquidity. These regulatory changes likely have affected the profitability of dealer intermediation activities and consequently the provision of market liquidity. For the Treasury market, the most important change in regulatory requirements appears to be the supplementary leverage ratio (SLR). The SLR limits the leverage of dealer balance sheets. In the SLR, all assets are treated the same in terms of required regulatory capital. Consequently, the SLR is much tougher on low-risk assets as compared to the risk-based capital measures that it complements. This makes the economics of repo-financing much less attractive. 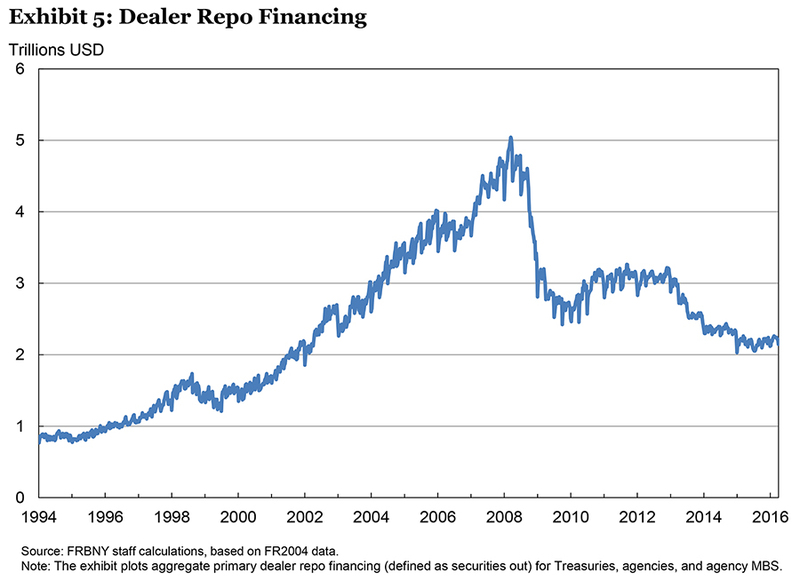 Not surprisingly, we observe significant declines in the quantity of repo financing by dealers (Exhibit 5). 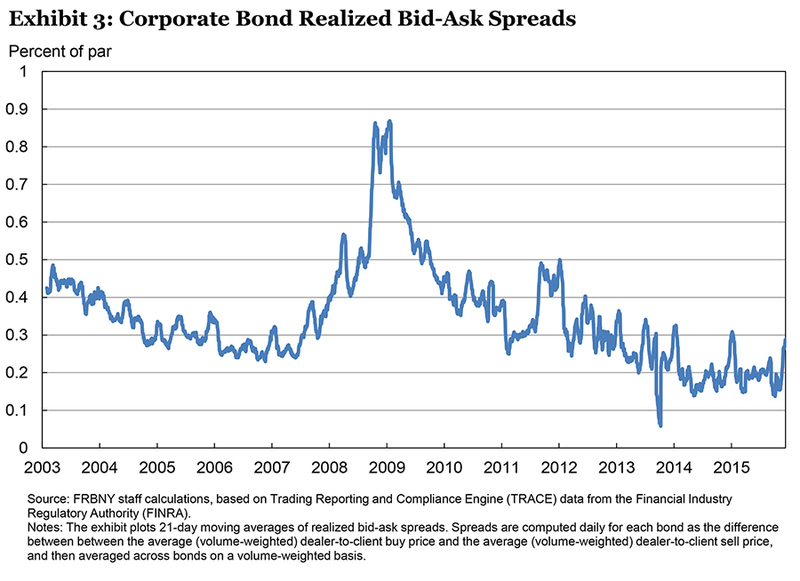 For the corporate bond market, the most relevant regulatory changes appear to be the increase in the Basel risk-weighted capital ratio, the Comprehensive Capital and Analysis Review (CCAR) stress tests and the Volcker Rule—which prohibits proprietary trading for a number of asset classes such as corporate bonds, albeit not U.S. Treasuries. We do observe significant declines in recent years in securities dealers’ holdings of corporate bonds (Exhibit 6). It would be surprising if these declines in repo and corporate bond holdings did not have some consequence for market liquidity. 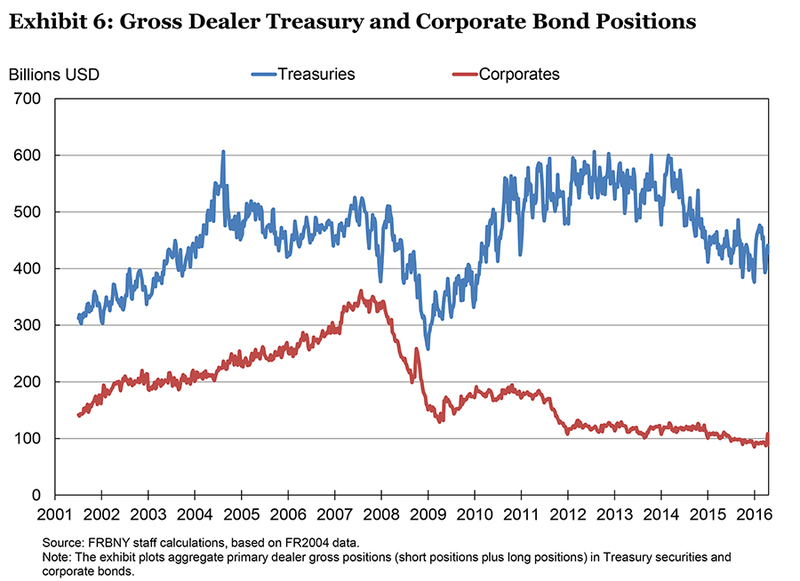 However, we do not observe marked declines in dealer holdings of Treasuries, even as overall dealer assets have stagnated (Exhibit 7). The stagnation in dealer assets might indicate that inventory risk has shifted from dealers to asset managers and other buy-side participants, reflecting a shift in market-making from a “principal” to an “agency” model. While increases in regulatory requirements have undoubtedly played a role, I think that other non-regulatory factors are also important. Liquidity provision is affected by changes in market structure, how trades are executed, and by competition from those operating outside of the regulatory boundaries that have been established for systemically-important financial institutions. Similarly, the demand for liquidity is also evolving with the growth of large asset managers, mutual funds, exchange traded funds (ETFs) and principal trading firms (PTFs)—which are sometimes referred to as high-frequency trading firms. 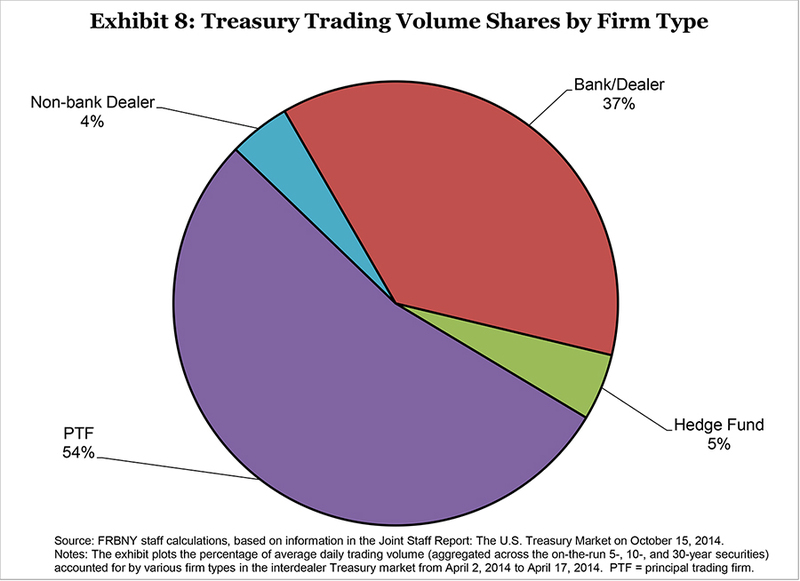 In the U.S. Treasury market, for example, high-frequency trading firms have seized a large proportion of the inter-dealer market in recent years (Exhibit 8). 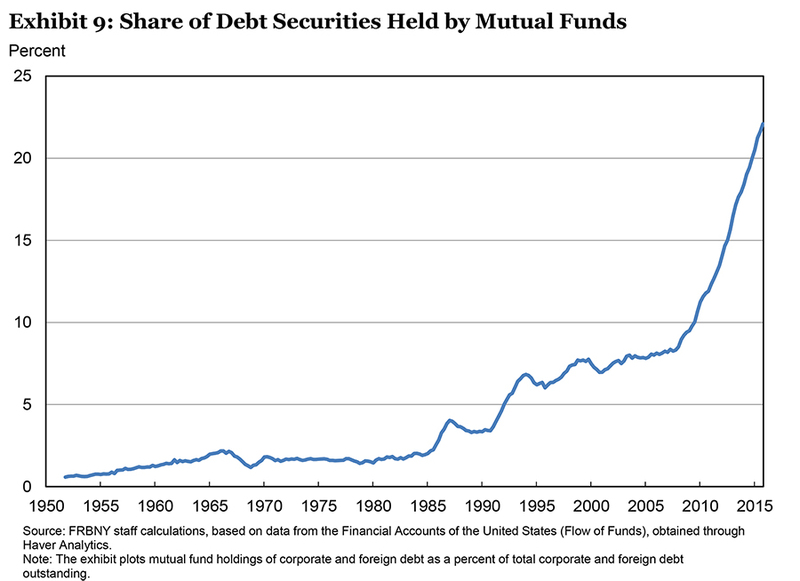 In the credit market, a rapidly rising share of corporate bonds outstanding is now held by mutual funds (Exhibit 9). Because mutual funds are not natural providers of intraday liquidity,5 their rapid growth may have contributed to the decline in secondary market trading activity. Fixed-income market liquidity may also be declining for cyclical reasons. Dealer inventories have historically been sensitive to changes in the size of credit risk-premia and term-premia (Exhibit 10). Finally, the effects of unconventional monetary policy on rate expectations and corporate bond issuance may also be affecting market liquidity. This is an area in need of further study. To reiterate, the evidence that market liquidity has diminished is mixed. But even if one agrees with the position that market liquidity has diminished, concluding that tougher regulatory requirements are the most important factor would be premature at this stage. The available evidence and common sense suggest that the changes in the regulatory regime are likely important, but we need to do considerably more work before we reach a definitive conclusion on their relative contribution. Furthermore, even if additional evidence supported the conclusion that market liquidity has declined due to the increase in the regulatory burden on the major securities firms, this decline would still need to be weighed against the benefits of a more resilient and robust financial system. During the last cycle, market liquidity was plentiful prior to the financial crisis. But, as the financial system became stressed and several large systemic firms teetered on the brink of failure, market liquidity quickly dried up. A somewhat higher cost for the provision of market liquidity during the more benign stages of a financial cycle might be worthwhile if it were accompanied by less volatility and stress when the cycle inevitably turned down. In fact, even if market liquidity costs are now going to be higher on average, this might be a small price to pay for a much more stable financial sector. Also, it is important to recognize that market liquidity conditions a few years from now may be very different from the situation today. If the cost of providing liquidity services has increased, this creates strong incentives for innovators to find better ways to match buyers and sellers. In my view, this innovative response is already underway. For example, in both the Treasury and corporate bond markets, firms are being established to more efficiently match buyers and sellers of less liquid bonds in order to reduce search costs and the need to carry inventory. Furthermore, execution algorithms have been developed that divide large trades into smaller sizes, thus reducing the costs of moving large blocks of securities. Market liquidity conditions could very well improve over time as innovation occurs in response to this new regime. Let me now turn to the topic of funding liquidity. I think this issue deserves as much attention as market liquidity. After all, during the financial crisis the demise of several major financial institutions resulted from their inability to finance their long-dated illiquid assets. The deterioration in funding liquidity also increased the degree of systemic stress as firms were forced to sell assets, which depressed their prices, undermining the solvency of firms throughout the financial system. As I noted earlier, while funding liquidity can be considered as its own distinct subject, it does have a direct link back to market liquidity. If firms that trade and invest in securities cannot obtain funding liquidity, this will likely lead to less transactions volume, thinner markets and less overall market liquidity. It is also likely to lead to less pricing efficiency resulting in wider and more persistent disparities in the prices of similar assets. Without access to funding, leveraged players, such as hedge funds, will find it more difficult to react to transient dislocations in market prices by engaging in arbitrage—that is, buying the cheaper and selling the more expensive asset. Without a reliable source of short-term funding, market functioning can become impaired, which can further disrupt funding and market liquidity. 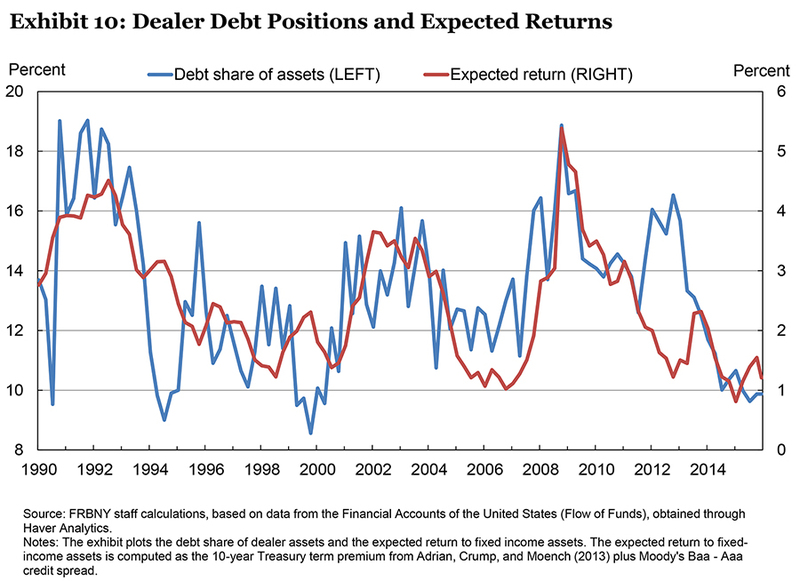 This can be seen by looking at the relationship between the volume of dealer-funded repo backed by U.S. Treasury securities versus the size of Treasury bid-ask spreads (Exhibit 11).6 During times of financial crisis—such as in 2008—sharp deleveraging of dealers’ repo books coincides with an increase in Treasury bid-ask spreads. However, during non-crisis periods, this correlation is quite low. This relationship between funding and market liquidity is also evident when we examine the relationship between the dispersion of Treasury yields relative to a fitted Treasury yield curve and Treasury bid-ask spreads (Exhibit 12). Large dispersions of Treasury yields from what is implied by a fitted yield curve may indicate funding liquidity strains, as market participants find it more difficult to arbitrage relative price distortions.7 Again, we see a strong correlation between the sizes of the yield curve errors and of bid-ask spreads during a financial crisis, but not during non-crisis periods. 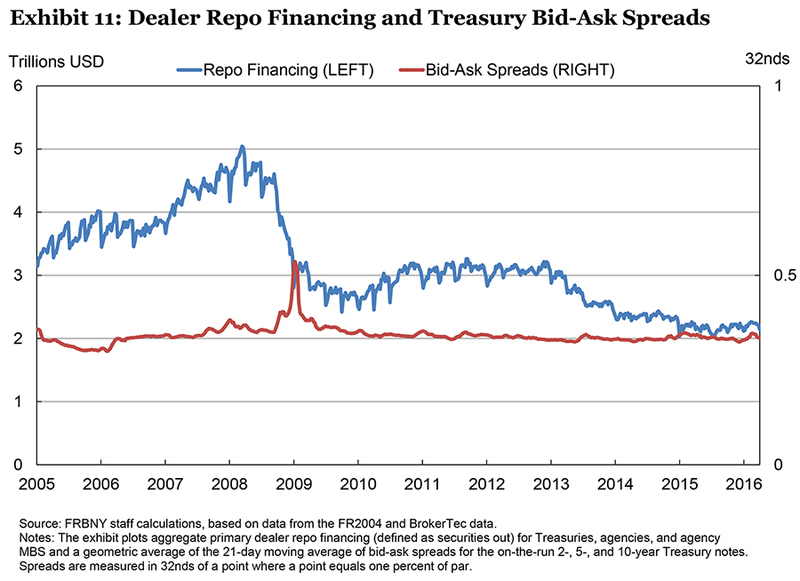 The drop in the availability of dealer-funded repo financing also appears to have led to less efficient arbitrage between closely related asset pairs, such as on-the-run and off-the run Treasuries, corporate bonds and credit default swaps, and Treasuries versus interest rate swaps. The price differences or yield spreads between the more capital intensive and less capital intensive assets have widened. For example, we can see this in the difference between the fixed-rate paid on a 10-year interest rate swap and the secondary market yield on a 10-year Treasury note (Exhibit 13). 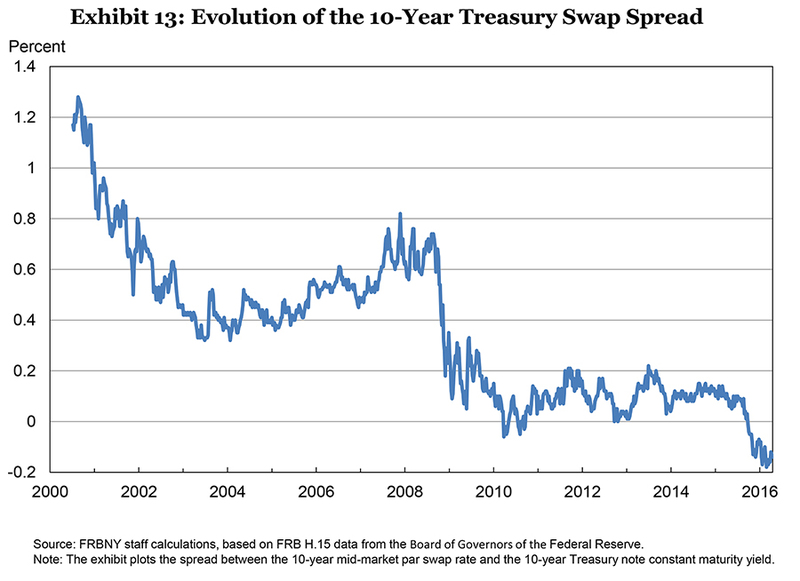 Whereas historically this spread has been positive—reflecting the fact that an interest rate swap has more credit risk than a Treasury security—the spread has been negative since September 2015. Market participants suggest that this shift has occurred because the higher capital requirements have made it unattractive for dealers to arbitrage away this dislocation. Similarly, dealers apparently are unwilling to provide the funding and the balance sheet capacity necessary for their leveraged clients to arbitrage away this dislocation. 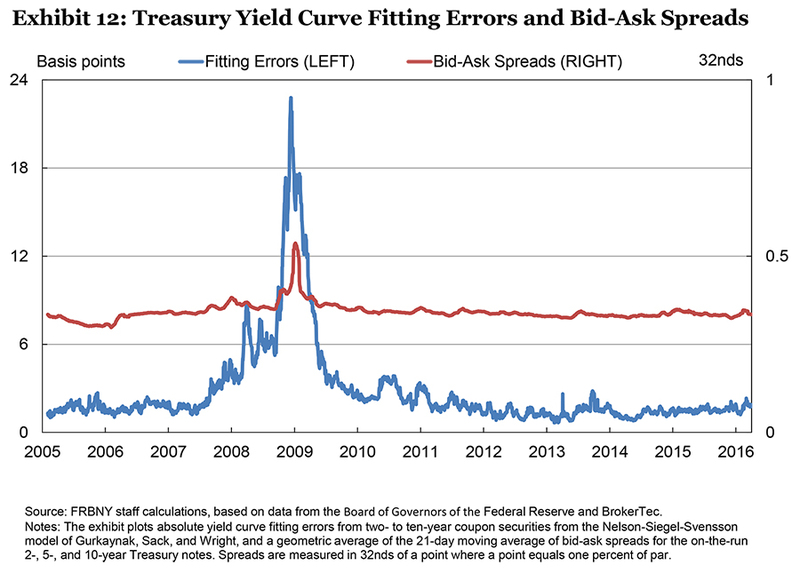 The degree to which this shift in the yield spread between Treasury and interest rate swap yields is due to the differential capital requirements imposed on cash versus derivative instruments warrants more investigation. Just as market and funding liquidity are interlinked, so are funding liquidity and capital requirements. All else equal, stronger capital requirements reduce firms’ vulnerability to runs. This suggests that funding liquidity risk can be addressed in many different ways. First, capital requirements can be bolstered to reduce the risk that a firm will become insolvent in particularly bad states of the world. Second, improved reporting and transparency can reduce the degree of uncertainty about whether a firm is solvent, thus reducing the risk that investors might wrongly perceive that a firm is insolvent, when, in fact, it still has adequate capital. Third, liquidity requirements can be increased to reduce the risk that the firm will have to engage in a fire sale of assets that might deplete its capital. Also, a liquidity buffer gives the firm’s management time to respond to bad events without having to resort immediately to selling assets. Fourth, a lender-of-last-resort can provide a liquidity backstop that makes funding liquidity more resilient. Consider the case when a counterparty is uncertain about how other potential lenders view a firm’s solvency. If there is no lender-of-last-resort backstop, this may cause firms to be unwilling to lend, not because they perceive the counterparty as insolvent, but, instead, because they are worried about what others think. That is, I may be unwilling to lend to you, not because I perceive you as insolvent, but because I am uncertain about how others view your solvency. If I do lend and others don’t share my view, will I be able to get my money back? With a lender-of-last-resort added to the picture, I no longer need to know what others think. As long as the lender-of-last-resort is available, if I am correct in my assessment that the firm is solvent, then I can be assured that I will be paid back. This issue was particularly relevant during the financial crisis when counterparties even pulled back from firms that were widely viewed as solvent. The Federal Reserve stepped in and created funding backstops for a wide array of assets, such as commercial paper and asset-backed securities. This bolstered the confidence of counterparties in one another and restored market and funding liquidity. Of course, this type of lending is only feasible to an institution that is deemed to be solvent with sufficient collateral available to pledge to the lender-of-last-resort so that it can safely secure its loan. In practice, all of these methods are in place to address funding liquidity risk. Capital requirements have been increased; there is much better reporting about how firms will do under significant stress tests; liquidity requirements—such as the liquidity coverage ratio—provide a buffer that allows management more time to respond to problems; and, if necessary, the central bank can act as the lender-of-last-resort to support market confidence and funding liquidity. In the U.S., given the restrictions on central bank lending, if a securities firm were to lose access to funding the remaining options available would be finding a means of replenishing the firm’s capital, selling assets, or selling all or part of the securities firm’s operations. While this might be manageable in the case of a firm-specific idiosyncratic shock, it might prove more difficult if a common shock was broadly hitting the securities industry. In this circumstance, the failure of one firm could increase the stress on other firms that were facing similar difficulties. If all of the requirements for Section 13(3) are met, the central bank could provide liquidity support. However, since this is not a certainty, it is worth considering possible alternatives. Now that all major securities firms in the U.S. are part of bank holding companies and are subject to enhanced prudential standards as well as capital and liquidity stress tests, providing these firms with access to the Discount Window might be worth exploring. To me, this is a more reasonable proposition now than it was prior to the crisis when the major dealers weren’t subject to those safeguards. More generally, I am happy to report that the Committee on the Global Financial System—one of the Bank for International Settlements’ central bank groups—is engaged in a project to determine what lender-of-last-resort gaps currently exist, focusing, in particular, on those that may create vulnerability in terms of financial stability. One area that I anticipate will receive considerable attention is whether there are any gaps with respect to the activities of globally systemic firms that operate on a cross-border basis. Another issue that still needs greater attention is the appropriate role for the home- versus host-country supervisor. The regulatory and supervisory responses for large, systemically-important firms that operate on a cross-border basis need to be closely coordinated, especially during times of stress. In particular, expectations about who will be the lender-of-last-resort need to be well understood in both the home and host countries. We have made considerable progress in recent years in enhancing the safety and soundness of the U.S. financial system. But there is more that we need to do. In particular, we need to study and understand how market liquidity and funding liquidity conditions are changing and what factors are driving that evolution. Conferences like this one go a long way in that regard. They serve as an important forum for discussing ideas and improving our knowledge and understanding. This will provide a solid foundation for any policy actions. Thank you for your kind attention. I would be happy to take a few questions. 1 Tobias Adrian, Nina Boyarchenko, Michael Fleming, Catherine Kung, Ernst Schaumburg, Joseph Tracy, Erik Vogt and Nathaniel Wuerffel assisted in preparing these remarks. 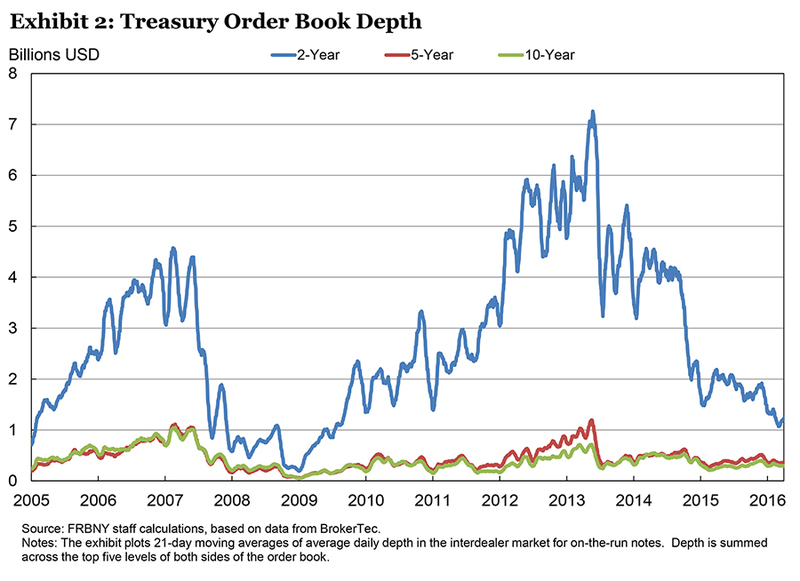 2 See Adrian, Fleming, Stackman, Vogt (2015) Has U.S. Treasury Market Liquidity Deteriorated?, Liberty Street Economics Blog, August 17, for further analysis of Treasury market liquidity. 3 See Adrian, Fleming, Vogt, Wojtowicz (2016) Corporate Bond Market Liquidity Redux: More Price-Based Evidence, Liberty Street Economics Blog, February 9, for further analysis of corporate bond market liquidity. 4 See U.S. Department of Treasury, Notice Seeking Public Comment on the Evolution of the Treasury Market Structure, January 2016. 5 Mizrach, B. (2015). Analysis of Corporate Bond Liquidity. FINRA Office of the Chief Economist. 6 Brunnermeier and Pedersen (2009) “Market Liquidity and Funding Liquidity” Review of Financial Studies 22(6) pp. 2201-2238 provide a theory that features strong correlation between market and funding liquidity during crises. 7 Hu, Pan, Wang (2013) “Noise as Information for Illiquidity” Journal of Finance 68(6), pp.2341-2382 provide further evidence on the relationship between yield curve fitting errors and alternative funding liquidity metrics. 8 A program or facility has broad-based eligibility only if it is designed to provide liquidity to an identifiable market or sector of the financial system. The program or facility will not be considered to have a broad-based eligibility if fewer than five persons or entities would be eligible to participate, or if it is designed to assist a company avoid bankruptcy, resolution or insolvency (including by removing assets from its balance sheet) or aid a failing financial company. See Regulation A, 12 CFR 201.4(d). In addition to the “unusual and exigent” circumstances and broad-based eligibility requirements, other conditions for making Section 13(3) emergency credit include obtaining the affirmative vote of a requisite number of Federal Reserve Governors and the prior approval of the U.S. Treasury Secretary, the emergency credit is not extended to an insolvent borrower, the lending Federal Reserve Bank is secured to its satisfaction, evidence is obtained regarding the unavailability of adequate credit accommodation from other banking institutions under prevailing circumstances to borrowers of the emergency credit, penalty interest rate is set for the emergency credit, and meeting disclosure/reporting requirements. See Section 13(3) of the Federal Reserve Act (12 USC 343) and Regulation A (12 CFR 201.4(d)).